Thanks this week to my guest, Amy Singer; to Peter Ffrench, an amazing tour guide and talented voice actor who got it in one take; and to sound artist Felicity Ford. In this episode: A badly behaving yarn is quieted with onion skins. Lifting the curse from felted slippers. Getting your lace on, with Amy Singer. A gentle walk through a famous village, and the words of a poet, read by an actor, in a boathouse. Rejoice with me! I made bad yarn behave using the information in Jenny Dean’s Wild Color. I made charts for my new book using EnvisionKnit software. I’m probably the only knitter in the world who manages to have trouble with felted slippers, but the curse has finally been lifted, largely due to Lorilee Beltman’s Felted Loafer Slipper pattern. Up next in the queue I’m saving the Claudia skirt, in Kauni Effektgarnyarn, for when I get all my work done. Recently checked off the list, A Knitter’s Manifesto Artist’s Edition is totally done. Knitsibs who’ve ordered, keep your eyes out for a parcel from me! 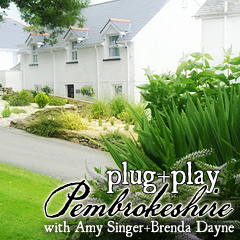 If you love lace, and want to learn how to make it love you back, join me, and the fabulous Amy Singer for Plug and Play Pembrokeshire (aka P3, aka The Brenda and Amy Show) at the beautiful Beggars Reach Hotel. We are very excited to be teaching together, for the time. In Wales! The full schedule of events for P3 is up there, over there, and right here. (Hint: Scroll right to the bottom for the price.) There’s also a Ravelry Group where we’re answering questions, sharing travel advice, and chatting excitedly about the event. I’ll be bringing all the Today’s Sweaters in my collection, and wondering how many shawls it is reasonable to bring to a three day event? Can’t make it to Wales? Amy is teaching in Edinburgh, Dublin and London. Check out her class schedule for details of each event. lovely episode ^_^ made my train ride to work wonderful – yarn look amazing!! I am totally enjoying the podcast. The taming of the yarn, your enthusiasm for the new charting software, the joy of the felted slippers, and yours and Amy’s total excitement about the forthcoming plug’n’play retreat all make for fabulous listening. I am also very proud and happy to see our project on iTunes and Amazon, and it was great to listen again to the audio we recorded at Laugherne. CONGRATS ON PRODUCING THE HUNDREDTH EPISODE OF CAST ON! So glad you are still here! Now you are ready for syndication! Actually looks as if you have syndicated yourself already, with the new CDs! It should be an internet party! Can we celebrate with a live chat session? We can have virtual cookies and tea and gin/whisky, they don’t hurt the waistline or muff up the knitting this way! Seriously congratulations, I am so happy to have enjoyed the first 98%, now I get to go listen to the most recent on the way home from work! Thank you for another beautiful podcast. 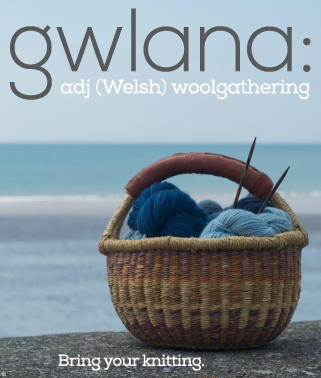 The combination of poetry, description of Wales, and knitting was perfect. Congratulations Brenda! 100 podcasts ~ well done you! Always a pleasure to spend time with your voice, thank you for this latest installment. Thanks for a great podcast. 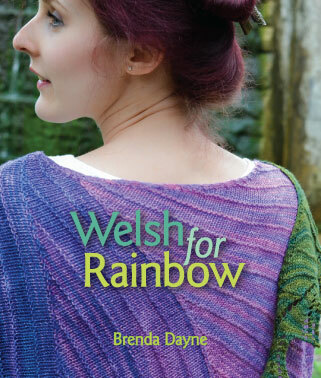 I’m looking forward to my Welsh for Rainbow update. 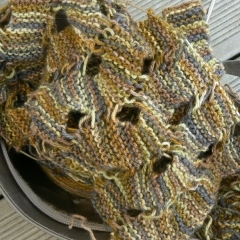 I have used Kauni before – I really like the long repeats of color. It is a good colorwork yarn. I believe its pronounced “Kaw-nee” like my name! I was knitting on my Summit as I listened to you talk about how you love the pattern! I’m loving it, too! Happy epicentennial (yes, I just made that up)! Another wonderful episode! Wherever you lead us after this hundredth episode, I have no doubt that the journey will be fabulous. 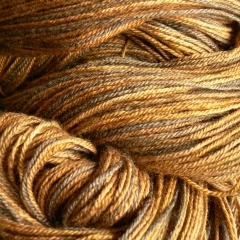 Your overdyed yarn turned out gorgeous. Thank you so much for this and all previous episodes. I’m always happy to have a new episode show up in my player as I know I have a special treat in store. The audio is always amazing and feels like a bit of a vacation in the midst of my busy life. Your voice is soothing and happy to me, and I can’t wait to see where the journey takes you and the podcast next. Happy 100th podcast! This last episode was *really* well-done and such a gift! Thank you!! Yes you’re like a dog with a bone on that yarn rescue, and the result is gorgeous! Thanks for the Dylan Thomas segment, very moving. While listening to the intro this time I threw confetti, blew a whistle and had a balloon launch. Happy 100! Seemed to take a 180 from the architecture idea. I am very happy about this, but still wondering, what happened on your end? Have only been listening for 6 months (back episodes…of course), soooo glad you will still be around and casting more. I’m very much looking forward to this “new” cast-on. I hope the workshop trips become a staple. I would LOVE to go on one, but need to pay off school, a car or two, maybe even the fridge…you know, in the future I *always* have more money. DT and the reader were BRILLIANT (say that part in a sing-song). Love all of it and you and all involved (as someone with a supportive spouse I know that behind every great woman is another great woman–mine is actually a man, but he doesn’t pee on the rim of the bowl so maybe we can count him). Sigh. I put it off as long as I could, listening to #100. It was very satisfying but it feels like an end of an era. Endings generally make me a little sad. Luckily I know I will love the NEW Cast On as much as the old. Good luck next month teaching with Amy Singer! I’ve just booked onto the October workshop. Am so looking forward to meeting everyone and learning new techniques. I just discovered your podcast through the Stitcher app for iPhone, which promptly placed your podcast at the top of the list when I told it I like to knit. Absolutely LOVE the podcast. The knitting chat, news and events, poetry and music are artfully entwined and very conducive to a delicious and fulfilling knitting experience. Great episode! And I have to say, the artist’s editions of A Knitter’s Manifesto is marvelous…I’m very, very much enjoying it! That was a wonderful 100th episode – I just finished listening to it a second time. 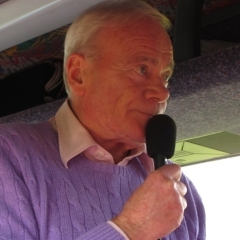 I’m really looking forward to the new sound Cast On and hearing about the same old yarns being re-dyed and re-knitted in new and interesting ways! Already I know I’m hooked! Within the first few minutes I was. I’m looking forward to going backwards through the last 100 and also to see your new direction! I, too, have listened to this episode twice. Excellent job! Thank you for all your hard work in the previous 100 and I look forward to more Cast On, regardless of the direction you take it. Once again, you included a song from one of my favourite Canadian bands, Great Big Sea. Thanks. I just moved to Europe and am missing home. Two thoughts- (1) I always, always tell others in my knitting group, “If you don’t like the yarn, just overdye it.” And they look at me strangely. Thanks for letting others know it is okay to overdye something. (2) How lovely to hear the Dylan Thomas piece. I have just been discussing this very topic with a group of knitters. How I think all the wonderful knitters there are “out there” somewhere, but we only hear discussion of those that have a “name”. And there are a LOT of lovely knitters that never get any recognition, but keep on knitting just to be knitting. You know the discussion. They never get the praise or the recognition, but they do such lovely work. Thank you for your podcast. I was there for the very first Halloween episode. Thank you so much for making many hours knitting so much more pleasurable! I’m looking forward to listening to your next venture.